Time for the Inspiration Challenge over at Splitcoast. Anne chose a wonderful Etsy site called “Jennspendants”. I chose this beautiful dragonfly necklace as my inspiration. And, this is also for the Mix-Ability Challenge from Lydia this week…having both smooth and rough elements on our design. My card base is a standard 4.25″ x 5.5″ size. Next I covered a piece of heavy white card stock cut slightly smaller with some Tim Holtz tissue wrap. I like to use Golden Matte Medium for this step but there are lots of options out there. Just paint a layer on your card stock, place the tissue wrap over top, smoothing it out. Then add another layer over top to adhere it completely. In this case I wrapped the edges around the back and added more matte medium in the same way to make it stick. Another option is to wrinkle it as you’re adding the tissue wrap to give lots of texture, but in this case I wanted it smooth. I stamped the dragonfly image in Ranger Jet Black Archival Ink and heat set it. Next I added some black gesso with a Catalyst Wedge for texture and Distress Paint with some burlap for more texture (my rough element) to various parts of the page. I also painted the wings with the Distress Paint too. The top layer of the wings were made by stamping the image on Clearly for Art Modelling film with black Stazon ink. Once it was dry, I cut the wings out and used my tiny attacher to add it to the page. Then I used my heat gun to shape the wings for a little more interest. Finally, for my sentiment I used Signmaker Alpha Parts. Wishing all my American friends and family a wonderful Memorial Day weekend! Back soon with more! Fabulously done! 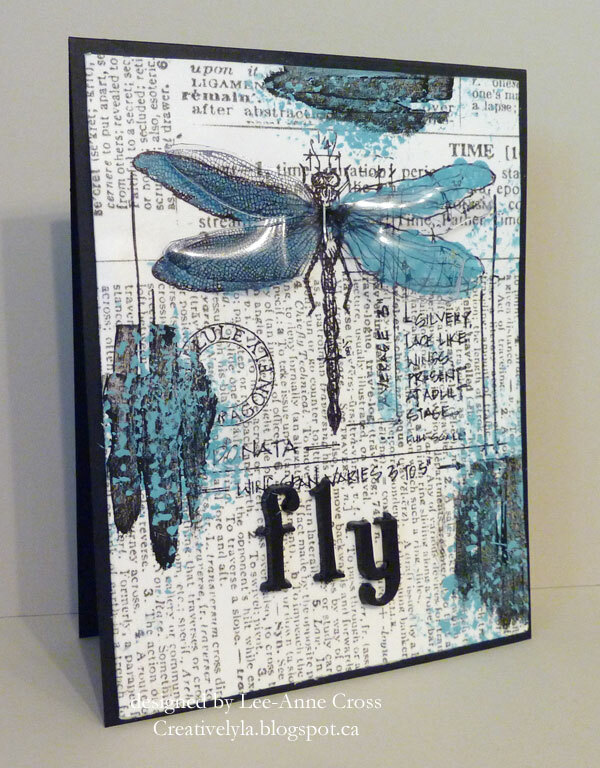 Love the newsprint in the BG and focal dragonfly is fabulous. I always love to see what you do with the Mix-Ability challenge. You always do a great job. Maybe I can learn something from you. Those dragonfly wings are beautiful. Now that is a stunningly creative card! Gorgeous dragonfly and background! Have a fantastic day! !